On Wednesday, 17 April, Mizuki Miyashita of the UM Linguistics Program hosted a series of events with Dr. K. David Harrison, an Associate Professor of Linguistics at Swarthmore College and a National Geographic fellow. Two days before Dr. Harrison’s visit, there was a viewing of the documentary “The Linguists” (in which Dr. Harrison is featured). At Q&A event following the film, Dr. Harrison updated his audience on his most recent projects: Enduring Voices, jointly ventured at National Geographic, and Talking Dictionaries at the Living Tongues Institute for Endangered Languages. Dr. Harrison’s public lecture, “Endangered Languages: Local and Global Perspectives,” was very well-attended, and every copy of his book “When Languages Die” was purchased at the book-signing. Dr. Harrison explains that out of approximately 7,000 world languages, 83 are spoken by 80% of the world’s population, and the rest by indigenous or small language communities around the globe in regions which he calls “Language Hotspots.” For example, the Ös language (also known as Chulym) of the remotest regions of Siberia is currently spoken by only 7 people. Dr. Harrison has made the very first recordings of some of these languages. In some cases, these recordings are of the last speaker’s speech. For instance, one of his Talking Dictionaries is of the Siletz Dee-Ni language in Oregon, currently spoken by only one person. Harrison describes how language death eventually leads to intellectual impoverishment in all fields of science and culture. These endangered languages contain “traditional knowledge” of plants, animal species, ecosystems and medicinal remedies. Sometimes language loss translates to the loss of worldviews. About half of world’s languages are predicted to become extinct in this century, including Native American languages of Montana. This event also raised an awareness of endangered indigenous knowledge encoded in languages of Montana, and brought together a diverse group of people: faculty and students of Linguistics, Anthropology, Native American Studies, Communication Studies, Environmental Studies and Music, as well as members of local Indigenous communities including Salish, Kootenai and Blackfeet. The event was supported by the Office of the Provost and Vice President for Academic Affairs, Department of Anthropology, Department of Environmental Studies, Department of Communication Studies, and Department of Native American Studies, Department of Society and Conservation in the College of Forestry and Conservation, Green Thread, the UM Linguistics Club, and the Linguistics Program. 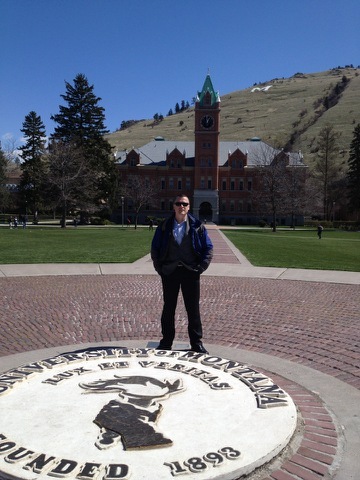 Dr. Harrison at the University of Montana. 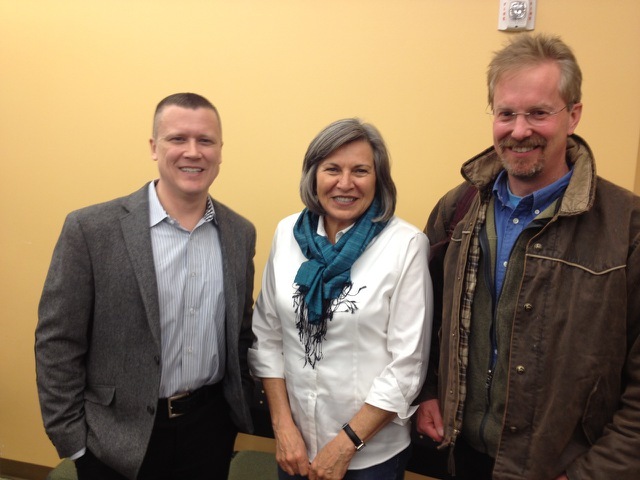 K. David Harrison with Salish tribal linguists Germaine White and Tom Smith. For more details about his lecture at the University of Montana, check out this article published in the Missoulian. Thanks for reading! This entry was posted in Endangered Language Activism, Enduring Voices Project, K. David Harrison, Language Hotspots, Launches and Public Events, Media and Publicity, Support Endangered Languages and tagged activism, campus presentation, endangered languages, enduring voices, global language diversity, k. david Harrison, linguistics, living tongues, local and global perspectives, Missoula, the last speakers, The Linguists, university of montana, When Languages Die by livingtongues. Bookmark the permalink.